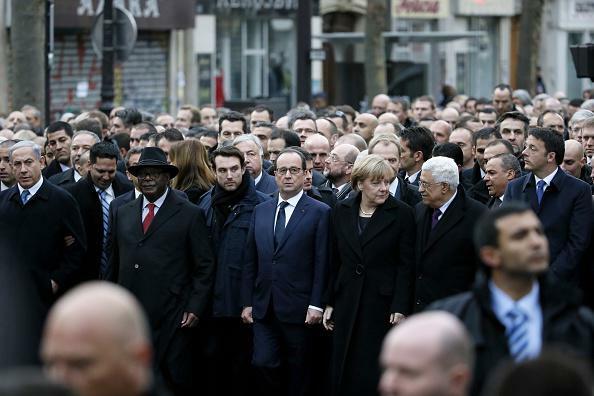 Obama, Paris unity march: White House says high-ranking official should have gone. From left, Israeli Prime Minister Benjamin Netanyahu, Malian President Ibrahim Boubacar Keita, French President François Hollande, German Chancellor Angela Merkel, Palestinian President Mahmud Abbas, and Italian Prime Minister Matteo Renzi at Sunday’s rally. White House spokesperson Josh Earnest said Monday that the Obama administration regrets not sending a higher-profile official to the unity rally held in Paris on Sunday. Heads of state from traditional American allies such as the U.K., Germany, and Israel joined French President François Hollande at the event, and Obama’s absence had become a meta-scandal, with correspondents such as CNN’s Jake Tapper and NBC’s Andrea Mitchell criticizing the symbolism of the president’s choice (along with reliably partisan politicians like Texas Sen. Ted Cruz and Long Island Rep. Peter King). Vice President Biden and Secretary of State John Kerry were also absent from the rally, as was Attorney General Eric Holder, who had already traveled to Paris for an anti-terror summit. America’s ambassador to France, Jane Hartley, was in attendance. Obama issued a statement condeming the Jan. 7 Charlie Hebdo massacre shortly after it took place and spoke further about the incident at a press conference later that day. He visited the French Embassy to offer condolences on Jan. 8, the same day the administration announced Holder’s plan to travel to Paris. The White House says security concerns precluded Obama from making a high-profile public appearance on short notice, while an anonymous administration source who spoke to the Atlantic ahead of Earnest’s remarks Monday said the rally was “not about us,” which the magazine interpreted to mean that Obama did not want to overshadow the European grieving process by attending. For other Slate coverage of the Charlie Hebdo shootings, click here.